I uploaded some quick shots of one of my drawing electives this quarter. At first I was in agony over which classes to take this quarter, in particular how to spend 4 hours every Tuesday afternoon: “Drawing the Human Figure” or “Basic Colour Skills.” Koos warned me the former was the most difficult drawing class offered, but basic color sounds like it could be… well, lamer. The system here is that you have to attend the first lecture to get into the class. Both being at the same time and worth the same amount of ECTS, the ten minutes before the first class I was running back and forth between drawing rooms, trying to decide which class to take based on who else was taking it. Human figure has favorite people from Multisensory! Basic color looks… unfamiliar and sedated. Eventually I found the teachers, also making it difficult. Human figure was taught by some guy who wore a purple sweatervest. Basic color was taught by Koos Eissen, who is if you remember, my drawing nerd crush. So at this point, it’s even. And it ends up that both classes are traditional classes in disguise. Human figure was just normal models and charcoal (charted territory, but interesting subject). Basic color was of products and watercolor (boring subject, but new media). But just one look at the watercolor examples decided everything for me. And I’m really glad I did it. My drawings are nowhere near the quality of anyone else, but for once I think I improved a little bit during the period of the class. I’ve never used watercolor before as a serious medium. They were just in those cheap kits for kids, with the crappy, brightly-colored plastic handle brush with black, synthetic bristles. It ends up I had purple sweatervest guy for my other drawing elective, of which I will write at a later time. All that agony over a handheld vacuum cleaner just to wake up fifteen minutes before class and not pin it up with the rest of the class! Egh, it’s okay, he came to give me feedback on it anyway which is more attention than what would be given in the class review. “And today we’re going to draw sandwich makers!” I was apparently the only one who thought that was kind of humorous. 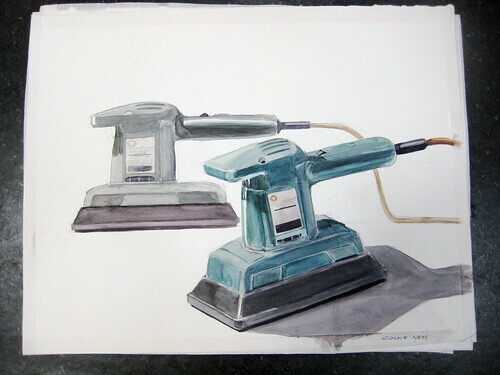 I tried to draw the hand-held vacuum cleaner today – I really need to start practicing more. At this point I just need to step back and try again tomorrow (or see if I like what I did any more), since I should really start reading for exams coming up at the end of October. I have a nerd crush on my hand drawing teacher, Koos Eissen. He has a book coming out on sketching for product designers. I took a picture this morning during class because while he has always drawn rather well on the chalkboard, I started geeking out when he was teaching us rounded surfaces. Below includes my hairdryer assignment that I muddled with my lack of knowledge on how to apply color (I know more now). Our assignment for next week is a hand-held vacuum cleaner. This past week was my first week of classes, of which I am currently taking 7. Since other IDE (Industrial Design Engineering) students had hand drawing in their bachelor program, we are put through a catch-up course to learn technical drawing. I’m lucky I have markers from 2.744, because they are super expensive over here (but apparently cheaper than in Norway). We have an electronics professor teaching us about how to make systems smart through signals and controls. While 2.671 was very much like this class in terms of lecture content, this class has no application until the exam at the end of October. And there is no reader for the course, just online links – some material is only in Dutch, and today I literally was linked to a Wikipedia article… This class is typically taken during the second quarter. This class goes over how design should be done and how designers interact with one another in groups. Thus we have two assignments for the term, to be done by me and my Dutch partner to maximize diversity. Here we learn about style, how it affects product interaction, and cultural manifestation through the products people use. We have a semester to come up with a product for a user group that are as polar opposites as possible. We also have to make appointments on our own during studio time to get guidance. The research we do in this class regarding physical, cognitive, and organizational ergonomics is linked to our main project class, Domestic Appliances. IPD (Integrated Product Design) students are working with Philips on 8 projects this semester. We have groups of up to 5 students to do the research, but each of us develops a concept to be presented at the end of the term through a snazzy video. My project is the develop some sort of kitchen appliance that encourages users to cook healthy meals. This is my only non-mandatory class this term. Our project is to design a product around a ritual, a la Japanese zen. I’m not quite sure how this class is going to be run in the future, but so far we’ve only had a half hour introduction. There is a website on which professor post content and announcements, called Blackboard. It’s supposed to be a one-stop location to help us organize our classes, but I actually find it rather frustrating to navigate. They should really put some IDE students to work on it. I am lucky that I get to take an elective (Form Study), since I don’t have to take the other catch up classes in electronics and ergonomics for exchange students. How the school came to this conclusion, I’m not sure. Another thing about classes here that I need to get used to, is that they’re really freaking long (all at least 2 hours), and that at every hour there is a 15 minute coffee break.